As a florist it is my job to continually try to come up with new, fresh ideas. I look for inspirations everywhere – nature, home décor, magazines, internet, TV….the list good go on and on. Recently I was given the opportunity to create a table display along with Leah at Envision Wedding Studio for the wedding show at Grand Falls Casino Resort. Leah and I were given free rein to come up with a unique, eye-catching table. We began brainstorming ideas, looking through bridal magazines for color inspirations. It was important to come up with a color scheme that was unique and had not been used in the past. Bold hues were our immediate direction. As the ideas started flowing we soon created a color palate of deep raspberries, burgundies, pinks, gold, and bright orange tones. As I sought out to create the bouquet for the centerpiece, I remembered reading a fashion article about the infusion of color blocking in the spring lines of 2012. This trend can be spotted everywhere. From dresses to skirts, to shoes and bags fashionistas can’t get enough of this look. 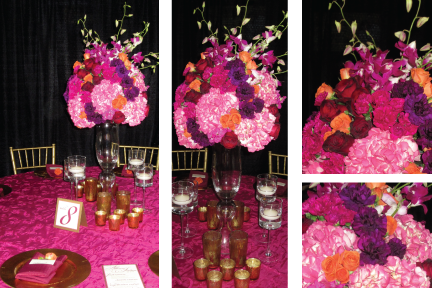 I knew the marriage between our bold color palate and the color blocking style would be perfect for the event. In the bouquet I used deep purple and raspberry carnations (I know the dreaded “C” word) however, packed tightly in a bouquet these often ridiculed flowers work great! Along with the carnations, deep pink hydrangeas, fuchsia orchids, pink stock, burgundy roses, and orange spray roses were arranged in a color blocking pattern to make a packed round bouquet. The result was a modern, eye-catching bouquet. Paired with a fuchsia linen, gold chargers, burgundy napkins, and clear and gold votive candles, the table came together beautifully. By drawing inspiration from fashion, we were able to create a memorable, stunning display. Posted in Wedding Flowers and tagged Color Blocking, envision wedding studio, Grand Falls Casino Resort.